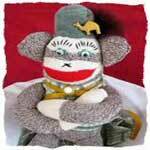 Sock monkeys began in 1920 and were made out of red heeled work socks. The red heel made a perfect mouth and of course buttons were sewn on for the eyes. Years later we find these same adorable monkeys made out of all types of printed socks. 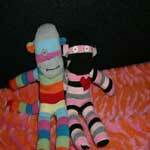 Make a sock monkey with socks that have pink or blue stripes, one with a heart or even one wearing a hat. Here's our own sock monkey instructions. 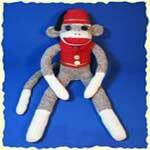 It doesn't take much in the way of materials to make this sock monkey. 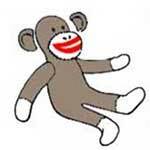 Nice instructions with pictures along the way for making your own stuffed monkey. Great instructions with colored pictures for an easy and fun project. 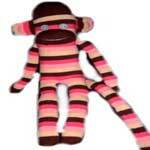 This monkey is a great gift on Valentine's or any other day and so cute. 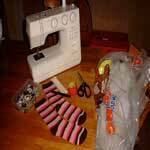 Easy to follow tutorial on how to make a sock monkey of your own. 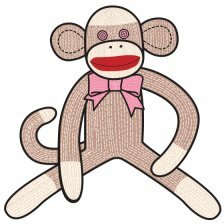 This is an old pattern for making a vintage sock monkey. 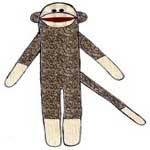 The new style pattern is from about 1970 and is just as easy to make as the old sock monkey. 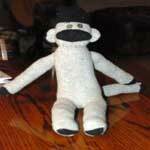 Step by step instructions on how to make this super sock monkey. Wow, I didn't know they actually make socks just for making sock monkeys.